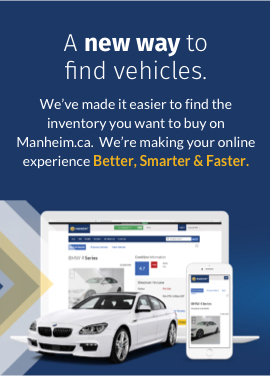 Find what you’re looking for: Access the thousands of vehicles at Manheim Canada auctions with the click of a button. This search tool will help you find the specific vehicles you’re looking for in the world of Manheim. Navigate our vehicle runlists efficiently with custom filters & enhanced search, vehicle histories, vehicle condition reports, and bookmarks. This new tool utilizes bookmarks, making it simple to locate your favourites for quick reference. Our advanced custom filters streamline search results when you’re looking for something specific. Quick in-search access to vehicle history and condition reports. Enhanced search makes it easier to find the vehicles you’re looking for. You can search our inventory through your MyManheim account.